…until you’ve read this article. A Single Customer View (SCV) is an essential tool if you’re serious about data-driven marketing. It pulls together all the data held across your business about your customers – both online and offline behaviour – and gives you a complete picture. It powers everything you do going forward – your segmentation, your marketing strategy, your automated campaigns, everything. If you’re interested enough to be reading this article, then you probably either already have one – or you want one. 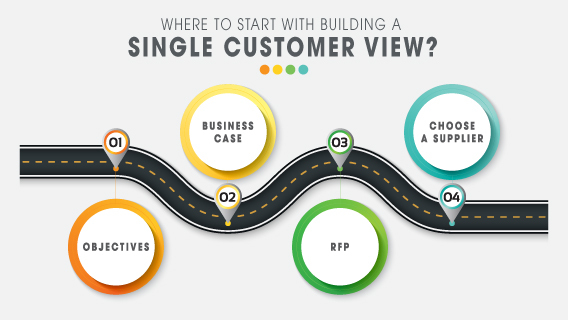 Where to start with building a Single Customer View? I’ve worked with many different companies, both big and small, across a range of industries and help them work out how they can maximise the effectiveness of their marketing. The one thing they have in common is a desire to improve how they segment and target their customers. So for pretty much all of them, having a robust Single Customer View is a pre-requisite. My job is to help them understand what they need a SCV to do, how to go about establishing their requirements and ultimately choose the right team to provide it. There’s no single solution for all companies – it’s all about finding the right fit. The first step is to work out everything you want your SCV to do. You might know what you want it to do, but it’s a certainty that someone else in your organisation wants it to do something else you haven’t even thought about. For example, the marketing team will want to segment the customer base, set up the right communications for the right customers and pull all the customer behaviour into one place. At the same time, Operations will be focusing on pulling together quotes, sales, refunds, claims, or whatever is important within your business. And senior management will want fast, accurate reporting across all channels. Meanwhile, the IT division may see it as an opportunity to simplify their systems and make their lives easier. The truth is, you’ll want it to do all these things – and more. So the first thing to do is to get all the stakeholders around the table and determine your requirements, in as much detail as you can. So document your business requirements and determine what’s in and out of scope. You’ll need this if you’re going to establish what it is that you need your SCV to do. This is critical if you’re still looking to get approval for your SCV. Try and tie as many of the objectives as you can to a financial outcome. You might be sure that you want to speed up your marketing communications, or reduce manual tasks, but knowing what impact that will have on the bottom line will help shape the business case form the very beginning. Build a robust business case to demonstrate what it’s worth to you. Remember to include not only increased sales and profits numbers, but also cost savings and the enhanced customer experience you can deliver. Your SCV can help you remain compliant with data protection regulations, by ensuring you’re in control of marketing permissions, opt outs and Subject Access Requests, for example. Some businesses have decided that the cost of building their SCV is more than offset by the potential of a huge fine from the ICO! And while you’re securing your budget, make sure you get senior buy-in to the project. I’ve seen clients get all the way to final pitch presentations, only for the MD and the Marketing Director to discover they had a very different understanding of what CRM was and what the tool would – or indeed should – do. A Single Customer View is only as good as the data that goes into it, so you’ll need to know exactly what data you have, what it’s value is, where it sits and whether you need (or want) it in your SCV. This is particularly important if data is held in disparate locations, in different formats or on a range of systems. Do you want all those application forms that are currently held as pdfs? Do you have any information held by a third party supplier? You might not want to throw everything into your SCV, but you need to make that decision before you start the pitch process, let alone the build. A data audit is a significant undertaking but it will highlight any gaps – as well as the opportunities – in your data. You’ll understand all your customer touchpoints, the various data flows across the business and whether any of the gaps are harming your customer journey. If, for example, you’re a travel company, your ‘welcome home’ email strategy will be severely hampered if the customers’ holiday details aren’t flowing through. Even if you’ve prepared properly by getting everyone around the table to agree what your SCV needs to do, I can guarantee that halfway through the process someone is going to put their hand up and say “Oh, we also need it to be able to do this”. At best, it will frustrate your supplier, increase your costs and delay the project. At worst, it can derail it altogether. It’s hard to avoid, but try to minimise scope creep by being upfront in your planning. The software solution you use is obviously important, but don’t too hung up on it. What’s really important is the data that goes into the SCV and the skills needed to get the most out of it, and to drive profitable activity. So think about the people you’re going to need – whether internal or external – to help get the most out of your SCV. I’m often asked which is the best agency or supplier to provide an SCV. The answer is always the same – it’s the one that right for you. Some companies want to break new ground and are looking for arty, creative thinking. Others will want a no frills approach. You may want a larger supplier, with unlimited resource to support you as you grow. Or perhaps a smaller supplier would suit you better, be more cost effective and keen to impress and keep you as a client. If you get the wrong agency, you’ll both frustrate each other, and you’ll end up paying a company for skills that you don’t want or need. Working with my clients I’ll normally have a good idea of what sort of agency will suit a particular company, and would usually invite at least 3 or 4 agencies to pitch, with the right kind of skill sets, to make sure they get the best match. It’s worth pointing out here that some companies will get their IT departments to build the SCV – but I’d generally caution against this. Unless you have someone who is experienced in building a SCV, you’re likely to be waiting indefinitely for it to be finished and even then, it almost certainly won’t do what you intended. Your business requirements will have moved on, as will the available technology. Your SCV is a great way of ensuring you’re compliant with data regulations. Once you have all your customer history and permissions documented, it’s simple to ensure that your marketing respects everyone’s preferences. You can also easily run Subject Access Requests (SARs), or process a Right to Erasure request, knowing that all the relevant data will be picked up, without missing anything. I’ll give you some tips on that in a separate article. In the meantime, do get in touch if you’re thinking of getting a SCV and need some help in getting started. Sarah has a brilliant track record in guiding her clients through the slalom of scoping out SCVs. You can find her on LinkedIn. We know her advice will help many of those looking to build a Single Customer View. Watch out for her next article on how to run a successful pitch, which we’ll also post here. But if you want to move faster and are looking for a trusted team to take you all the way then we would be happy to help. We’ve built hundreds of SCVs for companies all over the world, and even won awards for them. Just get in touch here and we’ll be glad to help you get started.